Creativity takes courage, it takes us out of our comfort zone and into the unknown. It takes us away from what we have always done and into a new energy and vibration. I have realised that as I get older and when I continue to do the same things in life or react to others and stress in the same way, I can lose my sense of adventure and vitality for life. When we forget how to get that inspiration and passion back, we begin to feel stuck and unable to move through a situation or a block in our relationships. Change is difficult and takes great effort and yet, sometimes all we we need is a shift in our perception of the situation and start being creative to try a new approach or a new way of thinking and this can move us forward. Often we just need someone outside of our circle to inspire us and guide us to try a new idea. Perhaps it is just doing something spontaneous or learning something new like, art or a language or a musical instrument, or training for a special event, or learning a new sport. When we create new ideas to inspire our life again, we bring a new energy to ourselves and to those around us. Below are some ways we can start. Sit down and make a list of everything that you love. Include all the things, people and concepts you are attracted to, passionate about and interested in. Don’t limit yourself. Very often, what we most feel like doing is not what helps us the most. When we are feeling low in energy or feel like sitting at home, that is when we need to be creative and try experimenting with something opposite and new. Sometimes doing something we have never done before, will excite and ignite us and shift our mood. Being uninspired and feeling detached has a physical component and effect, and this can lead us to being sedentary or feeling slow. To take us out of this physical and mental state, we need to be more physical and do activities like dancing, running, or hiking – or yoga. Anything that will move and stretch our body will help our thinking become more flexible and open. Even when you are not feeling it, there’s nothing like doing something spontaneous when you’re uninspired. Try something you have never tried before, like a trapeze class, a photo safari or go to a lecture on a topic you know little about yet. Grab your partner, or friend as well and just do something in the moment! Thankyou, I am glad you enjoyed it. Creativity is at our very core. It is how we have each arrived at the unique life situation we currently hold…….and it is the key to every wonderful new life circumstance we can imagine. What a wonderful article. PS Thank you for the NON-List. Just do it. Your words are so true. 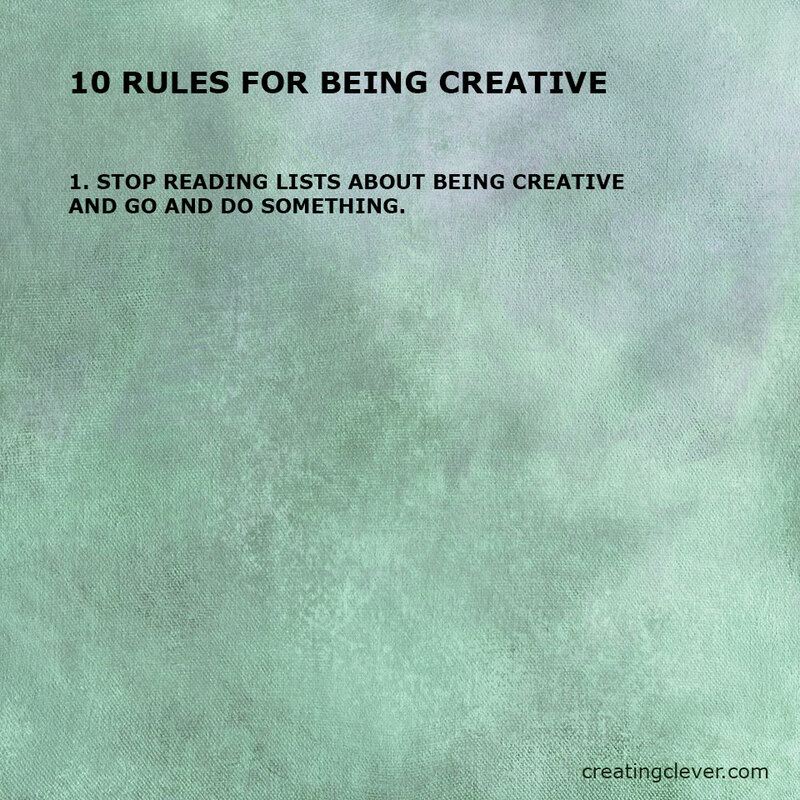 And sometimes not having a list is exactly what we need to inspire new creativity!! Thankyou for your comment. SO important as we get older to see things afresh … And shake things up a bit! Thankyou Julianne, it is an inspirational quote! I agree Eric, it is indeed a gift to feel comfortable being ourselves. Thankyou. Karen what you say here is so true. I have often had this kind of experience and there are times when it’s quite strange to see where the inspiration comes from. The power of a new idea is one of the most healing things to experience. It resurrects and propels you – no doubt. Great post. Thank you. It is a very healing process Don, you are right. Often I get stuck in thoughts like “I have experienced that before”, or “I know that” only to realise I know nothing!! and I always am so glad that I tried something new to inspire me. It also resurrects our relationships and that is always a good move forward. Thankyou for your comment. Thanks Carrie for a lovely comment. You are right, being curious and creative both help us grow and move forward. I agree with Rommel, that dare or that challenge to do something outside our comfort zone, could be the catalyst to change! I am glad you are creative and we all need to apply it to our work. Thanks for your comment. Your timing is perfect, Karen. Just what I needed to hear. You have a knack for that! Thanks MK. It’s great when we can be inspired by each other and even better when its in the perfect time. Have a wonderful day. We are a product of creation through the action of a loving God. We, as that product, possess creative potential. All we need do, is put it into action. The wind is a creation of God, not man. Yet man is creative enough to harness that wind and sail across an ocean. Understanding we possess this amazing potential and our ability to shift out of difficult situations, is often what we forget. This comment is a wonderful reminder of the gift we have all been given and can use anytime. Thankyou Alan. Karen loved this post, sometimes if I am not feeling the creative flow I watch a good movie and after it I want to create something. Other times I just let it go and spend time with the munchkins. It comes to me when I need it. You are so creative and gifted Kath. We all have different ways to connect us back to a flow and like you, sometimes we just need to let it go and chill out! Have a great creative weekend! Karen thanks you say the sweetest things, have a fantastic weekend also. Thanks Vicki! I appreciate your comment. Thanks for the reminder to not sit where it is always comfortable. Change is something we need to step into in order to live our life to the fullest. Wonderful and true! Living life creatively and full. Thankyou.